What the heck is a Manette Control? According to the Jaguar Factory Service Manual, that's the name for the control in the centre of the steering wheel with the horn button and trafficator control. Unlike a conventional car horn button, the manette control does not spin with the steering wheel - it stays pointing straight ahead. Well it's supposed to anyway. This is not the case in our Mark Seven. 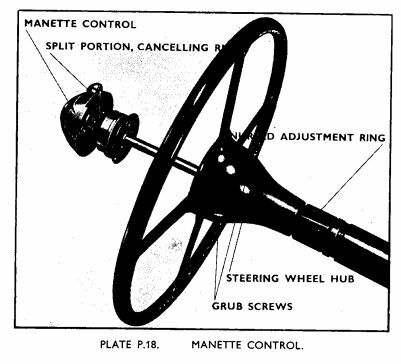 The manette control in our car spins with the streering wheel which is a pain in the arse when trying to activate the trafficators and it also defeats the self cancelling mechanism. The control is held static by a "stator tube" that runs down inside the steering column, with the wires for the electric controls running within this tube. From what I can work out from the factory manual, the manette control has a short shaft (not sure exactly how long) that then interfaces with the main stator tube. I think it's this interface between the two tubes that is faulty in our vehicle, the join must be worn out allowing the control shaft to spin within the stator tube. So I have to tackle this job. What I plan to do is disconnect the harness that comes out of the centre of the steering column at the steering box, attached a draw wire to it and pull the manette control out to inspect the end of the tube where it interfaces with the stator tube to see what repair work is needed. I hope it's this end and not the end of the stator tube that needs rework - the stator tube appears to be more difficult to remove. I'd love to hear from any other classic car owners who may have tackled this problem.